Over 2,700 responses to the Relational Abundance Survey suggest that where people experience high vibrancy, they also tend to find highly effective groups and collaborative leadership. The data also show that where people describe an experience of high vibrancy, they describe a high level of vibrancy experienced in all five primary relationships – to the self, other, group, nature (creative process), and spirit (creative source). Significant correlations were found between all facets of relational abundance, group effectiveness, and leader quality. These findings suggest that it is important to focus on all five aspects of relational abundance (self, other, group, nature, spirit) and not one single aspect alone. None of the correlations exceed .8, suggesting that multicollinearity is not a problem in these analyses. The five aspects of relational abundance explain 42% of the variation in group effectiveness ratings, meaning that relational abundance alone drives a significant portion of group effectiveness. In addition to the facets of relational abundance, leadership quality is also found to be a predictor of group effectiveness. When leadership quality is added into a regression model with relationship to self, group, and spirit (creative source), they explain 55% of the variance of group effectiveness. Surveys were collected from 615 group members in over 18 countries representing a variety of groups. This dataset does not include data from a global network that adds 74 countries to the database. The sample was comprised of 46% males and 54% females. The majority of participants had some level of post-secondary education and were thinking about a group related to their employment. Most participants were regular participating members. Table 1 displays the characteristics of the survey respondents. Group members who participated in this survey responded to five different facets of relational abundance: group experiences related to the self, experiences with other individuals in the group, experiences of the whole group, the process of innovation in the group, and the source of creativity in the group. Group members rated the extent to which they agreed with statements on a scale from 1 to 5, with 5 indicating favorable agreement with positive statements about the group. Results of data analyzed show that all measured facets of relational abundance were positive, with the means of all scores above the mid-point response of 3.0 (see Table 2). 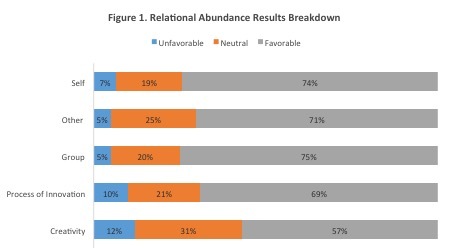 Although the majority of participants indicated experiencing favorable levels of all facets of relational abundance, Figure 1 shows that there were survey participants who experienced neutral and unfavorable levels. Responses to source of creativity received the lowest means score compared to the other responses. N Min Max Mean Std. Dev. Overall, the trends in the facets of relational abundance were consistent across survey demographics and differences in levels of relational abundance were not found between groups. Three exceptions were found in the analysis. First, education level was positively correlated with self, other and group facets of relational abundance. Participants with higher educational levels reported more favorable ratings of these facets compared to those with lower levels of education. This could be the result of many things, such as more choice in work environments or the groups they chose to describe. In addition, a significant negative relationship was found between all relational abundance facets and group size. The smaller the group, the more likely participants were to rate higher levels of vibrancy experienced. Additionally, the length of time the group has been established is also negatively correlated to all relational abundance facets. The more time a group has been in existence, the less favorable ratings of relational abundance were reported. Although these differences exist, the average overall ratings for both large groups and greater longevity are still favorable. In addition to relational abundance, participants were asked about their leadership structure and their perception of leadership quality in the group. Nearly half of the participants (49%) reported that they have a designated leader of their group, another 40% reported that leadership is shared, 6% indicated leadership rotates and another 5% indicated there is some other type of leadership model. Similar to relational abundance, on average, participants rated their leadership quality and group well-being favorably. These constructs were assessed using a 5-point Likert scale where 1 = almost never true and 5 = almost always true. In addition to these questions, participants were asked to give an overall rating of the quality of leadership where 1=extremely poor and 5=exceptional. Table 3 highlights the ratings for group well-being, leadership quality, and overall leadership ratings. Figure 2 displays the variance of these three constructs. Results of the overall group effectiveness measure show that respondents have favorable attitudes toward their group’s effectiveness. 66% of respondents rated their group as either “Excellent” or “Above Average” at meeting its purpose, with only 7% characterizing their group’s performance as “Extremely Poor” or “Below Average.” The average group effectiveness rating was 3.79 with a 0.87 standard deviation. Figure 3 highlights this relationship. Significant correlations were found between all facets of relational abundance, group effectiveness, and leader quality. These findings suggest that it is important to focus on all aspects of relational abundance and not one single facet. All correlations are displayed in Table 4. None of the correlations exceed .8, suggesting that multicollinearity is not a problem in these analyses. The five facets of relational abundance do not all have the same power to influence group effectiveness. Results of a regression analysis show that three of the five facets – relationship to the group, the creative source, and relationship to the self – were significant predictors of group effectiveness (see Figure 4). Of these three, the group facet was the strongest predictor. Combined, these facets explain 42% of the variation in group effectiveness ratings, meaning that relational abundance alone drives a significant portion of group effectiveness. In addition to the facets of relational abundance, leadership quality is also found to be a predictor of group effectiveness. When leadership quality is added into a regression model with relationship to the group, creative source, and relationship to the self, they explain 53% of the variance of group effectiveness (see Figure 5). Regression results reveal that leadership quality neither moderates nor mediates the relationship between relational abundance facets and group effectiveness. When leadership quality is added to the equation, relationship to self no longer contributes significant variance beyond what the other facets explain, suggesting that leadership quality may partially mediate the relationship to self.